Yeah, I know… everyone’s probably wondering why I posted a teaser of my Nook on XDA Developers and then leave it at that for so long. What can I say, I’m a procrastinator and I’m easily distracted into doing other things. Hell, it took me 2 weekends just to complete the theme itself. It looks complicated but it’s actually fairly simple. I’m using ADW EX Launcher with Desktop Visualizer. If you’ve used Desktop Visualizer before, you’ll know that it allows you to use images as icons on your Android desktop. What you’ll need to do is create a background that fits the Nook screen and create the icons in a way that they line up. 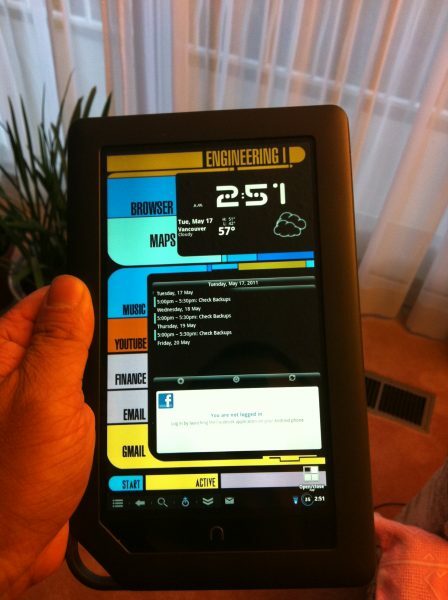 Here’s some quick instructions on get your Nook Color to look like the PADD of Star Trek fame. First off, you’ll need a Nook Color from Barnes and Noble that’s been modified to run an aftermarket ROM. Personally, I’m running Phiremod. I’m not sure if the stock ROM will allow you to run other launchers or not because I didn’t play with the stock ROM much. In fact, because I’m in Canada without a US credit card, I can’t get past the initial setup screens so I’m not sure if just rooting the stock ROM will let you run other launchers. Tap on one of the widgets you just created and you will be greeted with the Desktop Visualizer screen. 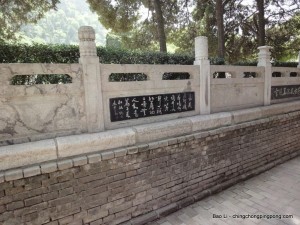 Hit Select Icon and select Image File. From there, select the appropriate image for the button from where you extracted the theme files and hit OK.
Make sure the Label field is clear otherwise, you’ll have text on your button. Now hit OK and your button. Continue with the other Desktop Visualizer widgets until you’ve done all 8. After you’ve done all 8, you’ll be almost complete. All you have to do now is to create the App button and choose your widgets for the two blank areas. To create your app drawer button, you need to long touch the desktop for the Add to Home screen. Select Launcher Actions instead of Widgets like you normally would and select Open/Close App Drawer. Create two of these buttons and move them to the bottom so that they cover up APPS. Now long touch the button until a menu comes up. Hit Edit and another screen should come up. On the left, press the button and hit Select Picture. Select AppButton.jpg from the theme location and hit OK. Repeat for the other App Drawer button you created. By now, your LCARS theme is pretty much complete and you just need to select your widgets for the blank spots. I personally like to have Beautiful Widgets running in the top spot and a calendar in the bottom but it’s up to you. If you can, find a widget that has a black background because any other colour really clashes with the Star Trek colour scheme. Once you’ve selected your widgets, the last thing you want to do is hit the menu button, select More and Lock Desktop. This prevents things from being moved around. Also, feel free to edit the buttons, wallpaper whatever. Grab a copy of Photoshop or GIMP and have at it, you just need to find the LCARS font somewhere on the internet which isn’t to hard to locate. On a recent trip to Las Vegas, I picked up a Nook Color from Barnes and Noble. As a lot of people already know, the device can be easily turned into a very capable 7″ tablet and it only costs $250 + tax! 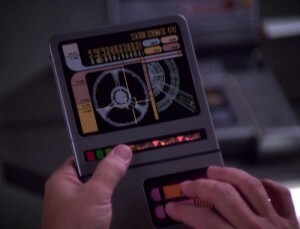 As a Trekkie, I immediately thought, “That thing is the perfect size for a Star Trek PADD!” After a few late nights of Photoshopping, I finally have it. I won’t go into details of how I did it at this time because I’m punching this blog up at work, I’ll save that for another post. I’ll also put the wallpaper and buttons up for download with the instructions as well. Here’s a preview….